In addition, 90 percent of OpenSim grid residents said they would recommend their grid to others. OSGrid — the largest grid running on the OpenSim platform — was also the most visited, with 82 percent of all respondents saying that they either visited the grid, or spent the most time on it. InWorldz was the second most-visited grid, at 56 percent, with ReactionGrid in third place at 40 percent. Other frequently visited grids, in decreasing order, were 3rd Rock Grid, German Grid, New World Grid, FrancoGrid, ScienceSim, Meta7, JokaydiaGrid, Heritage Key, Metropolis, SpotOn3D, Avatar Hangout, and Wilder Westen. All other grids in our survey were visited by less than 10 percent of respondents. One surprising result is that 17 percent of all respondents said that they have a personal OpenSim grid. Getting a user account on OpenSim grids is free, but running your own grid takes either substantial time and some technical skills, or monthly payments to an OpenSim hosting company. Running your own grid can also take a little bit of extra time or effort compared to renting a region on an existing grid. As with last week’s survey of OpenSim hosting providers, more InWorldz users responded than users of any other grid. This does not mean that InWorldz has more users than other grids — it’s currently in second place, after OSGrid — but it does reflect the engaged and passionate nature of its residents, and the fact that InWorldz grid managers are good at using social media and networks to promote their grid. 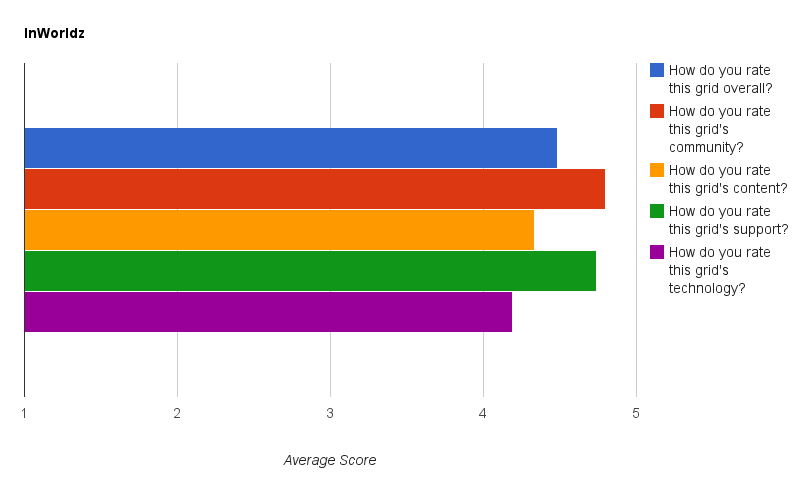 Using a score of 1 for “very poor,” 2 for “poor,” 3 for “just okay,” 4 for “pretty good” and 5 for “excellent,” InWorldz scored as well as or better than the typical OpenSim grid. InWorldz rated higher on community than the average OpenSim grid, with a 4.8 score compared to the average 4.6 score. InWorldz also scored slightly higher on content, with 4.3 for the grid compared to 4.2 overall. In support, InWorldz scored 4.7 compared to the 4.5 average. InWorldz’s overall score, 4.5, was the same as the typical OpenSim grid, as was its 4.2 score in technology. However, InWorldz’s higher scores for content, community, and support are in line with the grid’s reputation in these three areas. 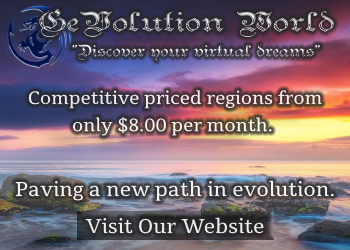 InWorldz is a closed commercial world which, while inexpensive compared to Second Life, charges a premium compared to some other OpenSim grids and hosting companies. As a result, it is able to allocate additional resources to support and community building compared, to, say, a non-profit, volunteer-run grid or a smaller startup. About 30 percent of all respondents, or 54 people, said that they spent more time on InWorldz than on any other grid. The positive comments predominated, but there were a few negative comments as well. One person, for example, though that InWorldz was suffering from its success, and as a result support was “just okay.” “They have too few people at the moment to do the support effectively for the number of residents,” the commenter said. Only one respondent said they would “definitely not” recommend the grid to others, two said “maybe” and 50 said they would “absolutely” recommend the grid. The one negative response was from a commenter who said they were in the process of moving out after four months on the grid because they felt “bullied” for raising questions and having different viewpoints than the grid owners. “Over time, it has left a bad taste in my mouth,” the commenter wrote. InWorldz differs from the typical OpenSim grid in that content is locked down. Users aren’t able to teleport in and out to other grids with their belongings, and the ability to export entire regions or inventories (which is an option on many other grids) is restricted. As a result, InWorldz is more attractive to content creators and people looking for a safe, secure environment — but less attractive to those who need backups of their regions, or the ability to travel to other grids. The grid scored 4.4 overall, with 4.8 for community, 4.1 for content, 4.6 for support, and 4.1 for technology. However, the margin of error for this set of results is significant, due to the lower number of respondents. Like InWorldz, 3rd Rock Grid is a closed commercial grid, with users unable to teleport in and out to other grids. OSGrid, the largest grid in the OpenSim universe, received slightly lower ratings than others, with a score of just 4.2 overall, 4.4 for community, 4.0 for content, 4.0 for support, and 4.1 for technology. However, OSGrid is a volunteer-run, free-to-connect grid. Many region owners run their own regions on home computers. The grid is also the primary testing ground for new OpenSim features and releases. As a result, performance is uneven across the grid, and there is no dedicated, paid support staff, with residents relying on each other for help. However, the community is also larger than all other grids put together and prices are the lowest — free for self-hosted regions, and starting at $9.90 a month for an entire region from third-party providers like New Voice. The German-language Metropolis grid was the only other grid to have more than 10 respondents, and did not fare well in the ratings. The overall score was 4.2, with 4.5 for community, 4.0 for content, and 3.9 for technology. In support, it scored 4.5, same as the average score of all grids. However, despite that, nine out of 12 repondents said they would “absolutely” recommend it to others, with two “maybe”‘s and one “definitely not.” The grid’s overall scores were significantly brought down by the one “definitely not” respondent. It should also be noted that the low number of respondents means that the margin of error here is significantly larger than for the survey as a whole. JokaydiaGrid, FrancoGrid, ReactionGrid, New World Grid, German Grid, Virtyou, ScienceSim, Meta7, Wilder Westen, WorldSimTerra, Role Play Worlds, Cybergrid, Heritage Key, MyOpenGrid and Your Alternative Life each had less than 10 respondents. Of these, JokaydiaGrid had excellent scores — 4.8 overall, 4.8 for community, 4.5 for content, 4.9 for support, and 4.3 for technology. JokaydiaGrid is a private grid focusing on serving the educational community. Hosting and technology is from ReactionGrid. FrancoGrid, which is a non-profit, free-to-connect grid based in France, also had very high scores, with a 4.9 overall rating, 4.9 for community, 4.6 for content, 4.6 for support, and 4.6 for technology. There were eight responders who said that FrancoGrid was their primary grid. The rest of the grids in our survey, while they had visitors, did not have any respondents who made it their primary home. These include SpotOn3D, Avatar Hangout, Open Neuland, VeeSome, Virtual RP, GiantGrid, NexXtLife, AlphaTowne, Avination, eceCloud and UFS Grid. Oasis World had no reported residents or visitors. From the results of this survey and our previous survey, it seems that there are several distinct communities forming in OpenSim, with different goals and requirements, which gravitate towards different environments. Educators and non-profits: Many educational organizations and non-profit groups seem to be setting up their own grids. Those with technical skills do it in-house on their own computers. The rest hire consultants to do it for them if they need a high level of security and control, or simply rent ready-to-go private label grids from vendors such as ReactionGrid, SimHost, and Dreamland Metaverse. For those not ready for a private grid, educators are converging on ReactionGrid and JokaydiaGrid, with some non-profits also looking at OSGrid and ScienceSim. Several other commercial grids are also trying to break into this market, including SpotOn3D, 3rd Rock Grid, and Cybergrid among others. Content creators: Content creators can be found on all grids, but those with a presence on closed commercial grids also often have private mini-grids either at home or with low-cost hosting providers so that they can make backups. Retailers: Many retailers are opting for closed commercial grids like InWorldz, which protects content by restricting backups and not allowing hypergrid teleports to other grids. Some retailers are opting to embrace the hypergrid, however, with stores on hypergrid-enabled commercial grids like AlphaTowne and GermanGrid, betting that the bigger audience on the hypergrid will offset greater potential losses to piracy. There is no data, however, as to whether content on hypergrid-enabled grids is actually pirated more often than content on closed grids, and the single greatest source of pirated content is currently Second Life itself, a closed grid. Retailers seem to be avoiding non-profit grids, where there is less of an infrastructure in place to protect shoppers from fraud, and few or no dispute resolution mechanisms. Consumers: For the most part, people seem to go where they already have friends. For much of the history of OpenSim, the large non-profit grids like OSGrid have dominated the user statistics. Lately, however, the commercial grid InWorldz has been making significant strides in attracting users, growing to be the second-largest grid in OpenSim in just a few months. More statistical data about OpenSim growth is here. eceCloud, Virtyou, Role Play Worlds, German Grid, Avatar Hangout, Your Alternative Life, Wilder Westen, JokaydiaGrid. List of OpenSim hosting providers and their prices is here. Previous story Will COMDEXvirtual match success of physical incarnation?